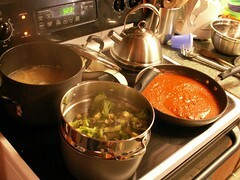 Whole wheat spaghetti with steamed veggies, broccoli, eggplant and zucchini. I also topped it with some of the homemade “cream cheese” I made yesterday. It was delicious! Sidenote: I bought a jicima plant to try with the boys the other day and we had some before lunch today and the boys actually liked it! It’s a watery sweet vegetable. They were not terribly crazy about it but they both ate a couple pieces, I was pleased :) It’s fun to try new things with them! This entry was posted in Family, Healthy Food Choices. Bookmark the permalink.